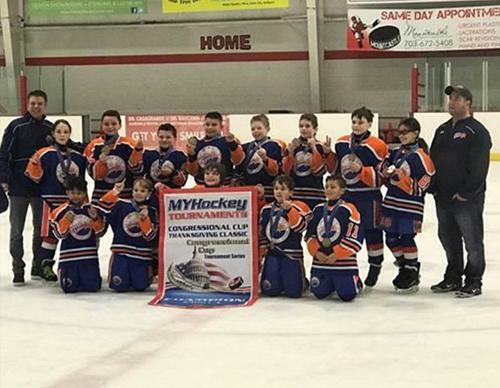 The GNY Stars Squirt AA team captured the Congressional Cup over the Thanksgiving holiday weekend in a thrilling final game. The Stars were undefeated in the round robin portion of the tournament with 2 wins and 1 tie which launched them into the championship game. The weekend started off with a convincing win by doubling up the Mercer Chiefs 6-3. They were led by Joseph Ludovico and Christian(Bongo) Bianco who each netted 2 goals and added an assist. The next game against the Old Bridge Jr. Knights had the same outcome but was much more intense. The Stars built a 4-2 lead on goals by Savelli Vorotnikov, Vittorio Marino and Christian(Bongo) Bianco(2) and Derek OLeary chipping in with 3 helpers. However, the real story was Ryan O'Hagan who was magnificent in stopping 37 shots including some key saves in the 3rd period as the Stars hung on to a 4-3 lead which ended up being the final score. The last round robin game was a matchup between 2 unbeaten teams as the Stars looked to avenge an early season EJ loss(6-0) to the Hunterdon Bears. It looked like that would be the case as they jumped out to a 2-0 lead on goals by Dario Rodriguez(highlight reel) and Vittorio Marino coming a minute apart. It would stay that way until late in the 2nd period when Hunterdon cut the deficit in half on a penalty shot goal. That gave the Bears some momentum heading into the 3rd and they promptly tied the game 30 seconds into the period and is where the scoring stopped resulting in a tie thanks to fantastic saves by goalies on both sides. Since the Stars were unable to settle the score with the Bears and produce no winner in their round robin encounter, it was only fitting they get one more crack at them. Fired up and ready to go, the Stars were hungry to bring home a championship. Both teams had chances but nothing materialized until the seal was broken midway through the 2nd period by the kids from Brooklyn. Vittorio Marino raced down the wing and fired a low shot at the pads which was initially saved but Leonardo Lechner raced in to slam the rebound home for the 1-0 advantage. The Stars increased their lead to 2-0 early in the 3rd period on a pretty feed from Joseph Ludovico to Sean Costello who fired it home from the slot. With Ryan O'Hagan once again stellar between the pipes the lead looked insurmountable but the drama in this one was just beginning as the Bears sliced the lead to 2-1 with six minutes to play and tied it on a penalty shot goal with just under two minutes to go in regulation. The score remained tied as time expired which brought us to a five minute sudden death overtime. It was fast and furious with back and forth action until a great individual effort was made by Christian(Bongo)Bianco as he rushed the puck from his defensive zone and was able to unleash a difficult shot for the goalie to handle. He had the presence of mind to follow it up and tap in his own rebound to set off a wild celebration. Congratulations to Coach Eric Diramio, Coach Jay Ludovico and to all the Stars players for their victorious weekend! !